Average Height	: 25" - 29"
Average Weight	: 100 - 150 lbs. The Newfoundland may be a descendant of the Viking "bear dogs" or nomadic Indian dogs. Others believe the Newfoundland is a close relative of the Labrador. This theory is based on the similarities between the two breeds and the fact that the coast of Newfoundland and Labrador are very close to each other. It is possible that the Labrador, which is an excellent swimmer, was able to swim the Strait of Belle Isle or cross on foot when the water was frozen. Many believe the Newfoundland originated from crosses between Tibetan Mastiffs brought to Canada by British or European fisherman and local dogs early in the 1700s. In any case, the resulting breed found a niche aiding fisherman off the coast of Newfoundland, Canada. Others say the Newfoundland dog is related to the Labrador, however not in the way stated above.... The breed was already in St John's in Newfoundland 500-odd years ago when Cabot arrived, this much is known from written accounts of visitors just a few years after his landing. The Vikings, who were here 500 years before that or another group may have brought the animal to these shores. The Labrador dog is descended from a dog called the St. John's Water Dog and selective pairing with the Newfoundland. In the early days of this breed, before they were called Labs they were known as "the lesser Newfoundland dog." The name Labrador was given to them after they started to become popular for their fine attributes. This gentle giant was used for hauling in nets, carrying boat lines to shore, retrieving anything which fell overboard and rescuing shipwrecked and drowning victims. The breed was also used to haul lumber, pull mail sheds, deliver milk and carry loads in packs. The Newfoundland was, and still is, an outstanding instinctive water rescue dog. Many owe their lives to members of the breed. In 1919 a gold medal was awarded to a Newfoundland that pulled to safety a lifeboat containing twenty shipwrecked people. It has been called the St. Bernard of the water. During World War II, Newfoundlands hauled supplies and ammunition for the armed forces in blizzard conditions in Alaska and the Aleutian Islands. Today, safer ships and improved communications have limited the dog's processional activities but its appeal has not diminished due to the fact that it is considered a handsome, devoted, delightful companion. It is still very good at water trials, competitive obedience, weight pulling, carting, backpacking, and as a watchdog and guarding dog. The Newfoundland Club of America holds drafting and water rescue tests. •	This gentle giant is known for their sweet disposition. •	This breed slobbers and drools a lot. •	Newfies are like big, loveable Teddy Bears. •	They love children, are intelligent and aim to please. •	Newfoundlands are happiest when they are with their family and do not do well left alone for long periods of time, or banished to the back yard. They can suffer from separation anxiety if left for long periods of time. •	Newfies, because of their giant body type, need lots of early socialization — dog parks, stores that allow dogs, walks, neighbors, exposure to many different sights, sounds, people and experiences from an early age. •	This breed would not do well in small spaces like apartments and condos. They need space. •	Newfies have a strong work ethic, need exercise, and mental stimulation. Ongoing training and dog sports are a perfect outlet for them. •	Newfoundland needs regular grooming. You can do it yourself, which is time consuming, or you can hire a professional groomer, which can be expensive. •	The Newfoundland thrives in cool climates, though he can adapt to living in warmer climates. To protect them from heat stroke, keep him near air conditioning or fans when it's really hot. •	Shedding is moderate - the bulk of it occurring primarily in the Spring and Fall. The best way to describe the temperament of the Newfoundland is summed up in the word "outstanding". This breed is docile and calm, loving and patient yet also alert, intelligent and prepared to help the family in anyway, including placing itself between a potential danger and the people that the dog loves. They are not a barking breed but their sheer size often is enough to warn people not to come too close. This dog will become completely devoted to the family and often will not accept leaving the family or moving to a new home. They have been noted to grieve a pet or family member that is no longer present. The breed does very well with other dogs, even smaller breeds, although males may be more aggressive when females are present. The Newfoundland requires little socialization to quickly adapt to all types of pets including cats. They are so calm that it is not uncommon for cats to snuggle up to these huge shaggy dogs and sleep on or beside them. Newfoundlands are usually easy to train and will almost housetrain themselves even as very young puppies. Occasionally they can require somewhat repetitive training practices so each dog may need a slightly different program. They have a strong desire to keep owners happy and will often try to anticipate what is expected of them before owners even have to give a command. The sweet temperament of the Newfoundland makes it extremely sensitive to criticism or a harsh tone of voice and they should never be trained using any type of negative or harsh punishment. They are independent when needed and can tolerate some time alone provided they have regular contact with the family and lots of positive attention. The Newfoundland is an excellent family dog that has no end of patience with children. They will seem almost saintly as they put up with even very young kids in a loving, calm and relaxed manner. The Newfoundland also likes to spend time playing with older kids and is a great exploring companion, ensuring the children are safe. Since they love to swim a Newfie will take every possible opportunity to jump into water and may need to be kept on a leash if you don't want to have to deal with a huge, wet dog. They love to travel and are always ready for a ride in the car, although they usually require a seat to themselves. 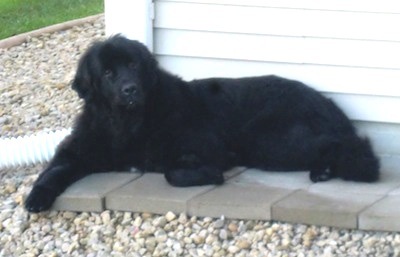 The Newfoundland breed has the same general Health Problems that other large to giant breeds have. Careful selection of Breeding stock can prevent problems with most of these conditions. SAS or sub Aortic Stenosis, is a serious genetic disorder that can occur in the breed. Test puppies at 12 weeks as well as dogs before Breeding. Canine hip dysplasia, Gastric torsion, elbow dysplasia and eye problems should also be carefully monitored. Occasionally Epilepsy (seizure disorder) and von Willebrands Disease, a bleeding disorder can be found in the Newfoundland breed. These conditions can be managed although Newfoundlands with these conditions should not be allowed to reproduce. The Newfoundland is an average shedder throughout the year and does need regular grooming to keep the thick, dense double coat from hopelessly matting. Most breeders recommend at least four times per week that the dog be completely groomed with a stiff wire brush, grooming rake or long pin brush designed specifically for large size dogs. This regular grooming will keep debris and knots from becoming irritating or problematic. In the spring and fall this breed will completely shed out their thick undercoat. Known as "blowing" the coat, this shed is truly amazing in its sheer volume. It is not uncommon to remove a garbage bag or more of the soft, downy undercoat. In some areas this "wool" is made into a natural fabric similar to preparation of sheep wool. It is interesting to note that Newfoundlands that are kept indoors in regulated climates will not develop a full inner coat, therefore cutting down on year round and seasonal shedding. The Newfoundland has natural oil in the coat that keeps the inner and outer coat water resistant and somewhat dirt resistant. Avoid washing this dog whenever possible and use dry powder shampoo only when required. The more bathing that is done to the dog the more damage will occur to the hair and coat. Carefully check the ears for debris or waxy build up and carefully check the eyes for any sign of tearing that may indicate eye problems developing. The Newfoundland is a very calm breed that is prone to turning into a non-exercising dog if allowed. They will happily go with owners on walks or outside to explore, but they are not good at self-exercising. If there are other dogs present they are more likely to complete a bit of exercise but otherwise they will usually just find a comfortable place to lie down out of the heat or weather. Newfoundlands are prone to weight gain and do need to be exercised on a regular basis to prevent obesity and health concerns related to increased weight. Since they are a large and heavy dog fast runs and sprints are not as preferred as slower, longer jogs or brisk walks in cooler temperatures. They are not an extremely playful dog once they mature but some enjoy a short game of fetch. The Newfoundland does absolutely love to swim and will happily use any pond, pool or lake they can find to get out and go for a swim. It is very important to watch for any signs of breathing problems of excessive drooling when exercising these dogs in warm weather. With their heavy, dense coats and massive size they are prone to heatstroke and need to be closely monitored. Provide lots of water and try to exercise lightly in the coolest possible times of the day during the summer months. Growing puppies should not be over-exercised as they may develop growth problems or OCD from too much strain on joints and cartilage during their developmental stages. A Newfoundland can take up to two years to fully mature so be cautious with their level of exercise at this time. The Newfoundland does best with slow paced, repetitive training that focuses on positive achievement. While not a rapid learner they will make steady progress and once they have mastered a command they will rarely if ever forget it. The Newfoundland is very sensitive to the owner or handlers tone of voice and should never be yelled at or punished during training. A simple "no" or removing attention for a few minutes is all that is needed to correct the breed. Since they are a very large dog, even as a puppy, it is important to provide them with the right type of area for training. They should be working on a floor that is carpeted or outside, never on highly slippery or polished surfaces. Remember that while puppies are growing they may be somewhat uncoordinated and clumsy and will need some additional time to get their bodies organized before they can sit, stand or lie down on command. Avoid rushing the puppy in commands or pushing or pulling on their legs or hips for any reason. When training the Newfoundland it is always easier to start very young before the puppy gets to full size. It is also critical to keep in mind that these dogs need to be kept out of the intense heat so try to restrict training periods to short periods of time in the cool of the day. They seem to learn best with three or more short training periods per day rather than one long training time. Always end training times with some positive interactions. This breed tends to bond very strongly with the whole family but typically learns best when taught the commands until they are mastered by one person rather than everyone in the family. Once trained this dog can easily be controlled by younger children once they have been taught how to work with the dog. Occasionally males can be somewhat aggressive to other males so early neutering is recommended for safety and temperament reasons.